Yippee for the Confetti Stitch! Are you as excited as I am to learn about the confetti stitch? While the defintion of confetti stitch is: a scattered single stitches as confetti stitches. The stitches are spread across the fabric as if they had been sprinkled like confetti. It is a bit more complicated than that. There is a method to the madness of the confetti stitch. Learning this stitch will not cure cancer or even make you the most happy person in the world, but it will help you become a better cross stitcher and add a level of depth to your cross stitch project. So, settle in and let's learn this fun and festive stitch. Beginning with a loop is especially important when creating a confetti stitch. Better Cross Stitch Patterns show us how to use a loop to start a project and then goes into how to do a confetti stitch. This may look complicated but once you check out the tutorial, it will be very easy to follow along and continue with the stitch. You can read more about this process and see a tutorial on the project HERE. Another example of confetti stitching can be found on Little Thread Craft. This tutorial and explanation is a bit more in depth. Again, don't feel overwhelmed. This tutorial, like the others, is easy to follow and if you get hung up, Little Thread Craft is more than willing to help you out. She explains the stitch and then gives a little example of what the stitch looks like. Check out her version of confetti stitch HERE. ​​There are so many stitches out there that learning even just one can be overwhelming. Pinwheel Ponders has a great blog post on learning stitches. Her post, 55 Helpful Tips for Cross Stitchers is an excellent guide on how to do various stitches and tips to make them look their best. This blog post isn't as in depth as others, but it does give you a good starting point and also allows you to see other types of stitches and how they can all be used together. Check out the entire blog as well as the entry HERE. Still dumbfounded by the confetti stitch? Still needing some tips? Well, Meari's Musing has a few ideas for you. Although there are not a lot one the page, they are very helpful and will definitely keep you from pulling out stitching and your hair. Check out the tips HERE. Are you totally overwhelmed with information regarding this one little stitch? Who knew that this stitch could be so complicated.The reason is because it looks so easy and so scattered but creating that scattered look can be complicated and can cause chaos for the other stitches. Once you have this stitch down, you will see how easy it is. Just give yourself time to learn the stitch. Try a few practice pieces on scrap fabric. Each one of these tutorials are different so try each one and see which one clicks for you. ​Because you are making a bunch of scattered stitches you do not want knots in the back of each one or waste your floss by dragging it across the fabric. This is the reason the stitch is a little more than the normal row stitch. You can hide a lot of mistakes with the row stitch that you can't hide with the confetti stitch, hence the loop method to start and finish one stitch. ​Confetti stitches are great for creating a stencil effect on fabric. 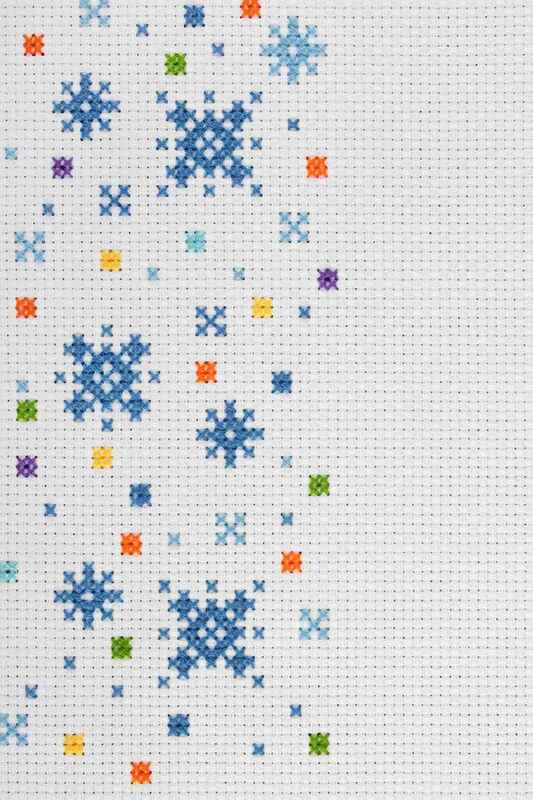 It is a great stitch to use if you want to do your cross stitch in just one color. Lettering and cameos look great with the confetti stitch You can outline and create a picture with this stitch,and using different colors will make it pop even more. This type of stitch will give your cross stitch piece a beautiful 3-D appeal to it. Give the stitch a try and create a one of a kind piece.